Eli Yosef congratules the winner. The International Raoul Wallenberg Foundation and Casa Argentina en Israel, together with the Department of Education of the City of Jerusalem jointly convened a competition on the Swedish diplomat, in which several schools of the Israeli capital participated. 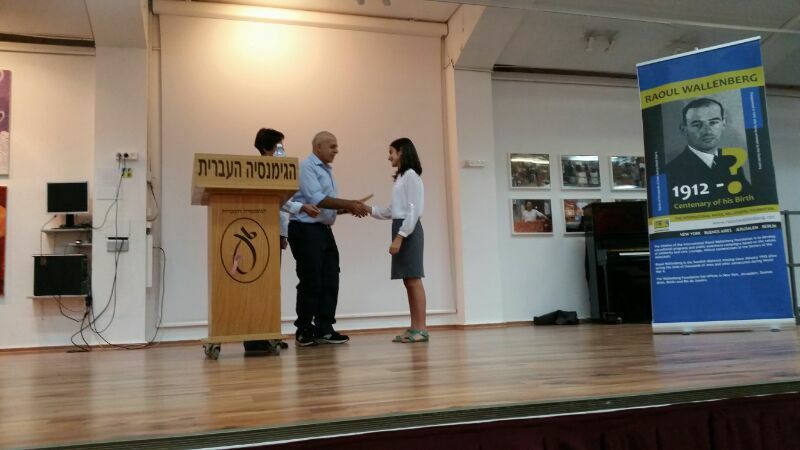 On 17 June, a moving ceremony honoring the awarded students took place at the renowned Gymnasia school in Jerusalem. On behalf of the municipality, the young participants were congratulated by Ms. Hava Bar Tur, head of the department of Secondary Education. Ms. Miri Reuben, director of secondary school in the Gymnasia, and on behalf of the International Raoul Wallenberg Foundation, the educator Eli Yosef, head of the educational project, presented the awards. – Ilay Hazan Harn of the Hartman Institute. 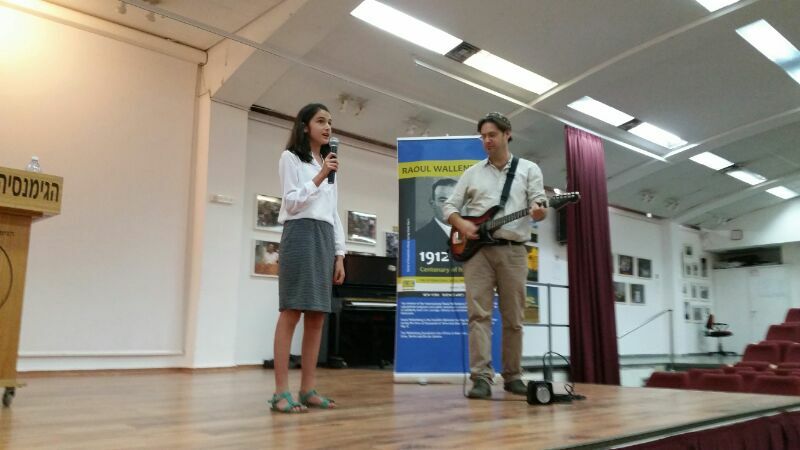 Ilay composed the words and music of a song titled “Sacrifice”, in honor of the Swedish diplomat, which was played at the ceremony, accompanied by the guitar from his father. – Neni Itzhayek of Gymnasia school: original photographic work depicting a situation describing the triangle: the executioner, the victim and the indifferent witness. – Tair Cohen from Gymnasia school: a poem in which he described an imaginary meeting between Hana Shenesh and Raoul Wallenberg, Raoul represents the light in the dark times Hana looked after. Sacrifice: song composed and performed by Ilay Hazan Harnof. The competition on Raoul Wallenberg is a joint initiative of the International Raoul Wallenberg Foundation and Casa Argentina en Israel, established in Israel since 2012, to mark the centenary of the Swedish diplomat and who have joined several local municipalities. It is aimed at Israeli schools, and seeks to highlight the life and heroic deeds of Raoul Wallenberg and disseminate his example – and other rescuers – among the younger generations.